My first time in L.A. was in 1987, when I was 14 and my parents took me and my younger sister to Disneyland. I’m from Houston, and the only thing I remember is that the phrase “horrible traffic” was already in my head. Unluckily enough, coming back from Disneyland we indeed sat bumper to bumper, not moving for hours. I will never forget the feeling of living in that traffic. When I came back home, I don’t think I even talked about Disneyland, but I remember talking about the horrible traffic. In 2001, I moved to New York after graduating from a theater master’s program at the University of San Diego. I was new to the concept of pilot season. I would trek from one casting office in New York to another, where they would put my auditions on tape and send them out to casting agents in L.A. You tape about 15 or 30 or 50 of these things without hearing back before you begin to wonder if anyone in California is actually watching any of them. I remember thinking, If they had two people they equally liked, one in New York and one nearby, why would they spend all that money to fly me out and put me up? Looking back, I do think that’s what kept me from getting too many pie-in-the-sky dreams. There’s just no telling when or if your number will be called. So when I was flown out to L.A. to audition for several pilots, I was shocked and I was frightened, but most important, I was dirt-poor. Parsons will costar with Julia Roberts in the film version of Larry Kramer’s play. 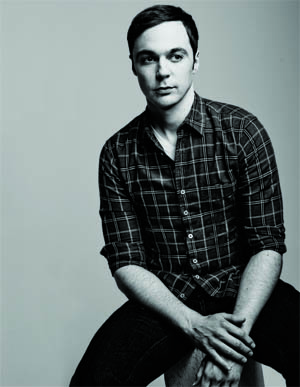 As Sheldon Cooper he gives geeks a good name. A bit part in Zach Braff’s indie helped kick off his career. Ultimately, moving to West Hollywood and being cast on The Big Bang Theory changed my life. I’ve spent little time here without a purpose. L.A. is relaxing if you’re on vacation, but it’s very difficult if you’re not working. The sense of expansion, the seductive weather—you could live here forever and get nothing done. It’s like what Spalding Gray said about L.A. in his Monster in a Box monologue, which is something like, You start the day with some coffee, sit down to write, then the sun starts coming through the window, and sure enough, your day is over. It’s a city that feels like it has no boundaries, and sometimes you really need to have some goddamn boundaries, even if that means just sitting next to someone on the subway. Which isn’t to say I don’t like riding around in my car—I love it. When I first moved here in 2004, I bought a used Jetta because I figured if The Big Bang Theory didn’t get picked up, I could still afford to pay it off. Eventually I started leasing a BMW, and it was probably the first time I enjoyed driving, so now I have a fancy car. Nothing can duplicate being in your own metal bubble with your own music. I don’t understand the perception that people in L.A. are dumb. There’s zero truth to that. Some of the smartest people I’ve ever met live here. If you want to find vapid, you can find it anywhere. I remember I had a good friend while I was in school in San Diego who theorized that Southern Californians are “weak” because there’s no bad weather—no snow, no hurricanes—except for earthquakes, but not as regularly. Somehow the lack of suffering makes Angelenos seem goofy or dim-witted. But I have to say you make a big mistake by underestimating the tanned brain in L.A.